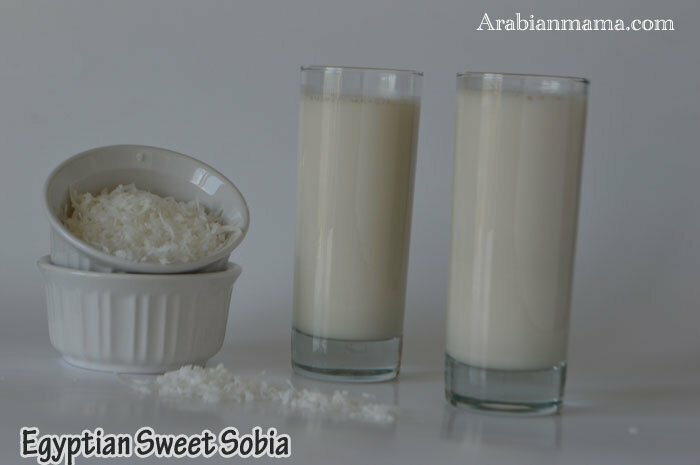 Sobia is a starchy, milky sweet coconut drink, that is really a thirst quenching drink. Hello again from the beautiful, weather crazy Colorado. We are back and kids went to school so our life is going back to normal, thanks God. 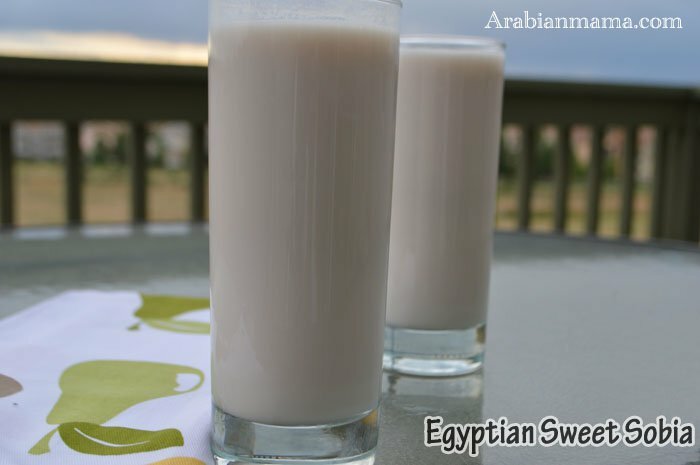 Today’s drink is one of the top popular beverages in Egypt during the holy month of Ramadan. It is commonly sold by street vendors packed in plastic bottles. This drink is a real thirst quencher, a refreshingly cold sweet drink after a long hot day of fasting in Ramadan. Everyone loves this drink specially kids. 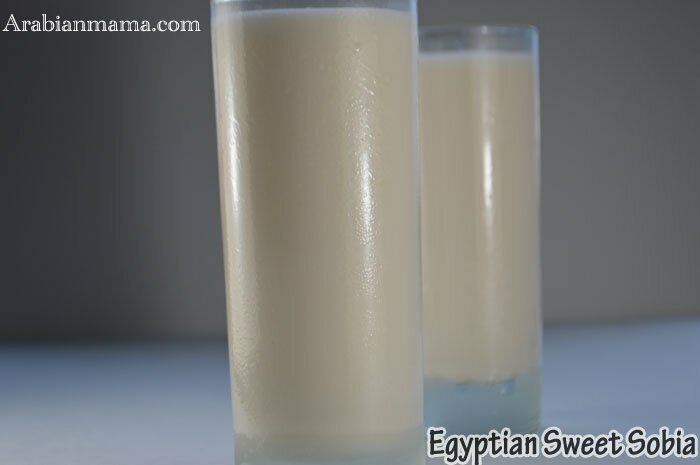 The drink is prepared by soaking powdered rice over night, then mixing it with coconut milk and sugar plus some other ingredients, chill and serve cold. During making my homework for this post I found that it is very close to the Mexican Horchata. Horchata is a cinnamon and vanilla flavored rice drink but Sobia is coconut flavored rice drink. Also there is another drink called Sobia very popular in Saudi Arabia but totally different you can check it out here at Noor’s blog. I hope you’ll try this drink for a change in this hot days of summer. Have a great weekend. Here is a short video on how to prepare Sobia on my youtube channel. 2 Tbs dry, uncooked rice. 1/4 C sugar- more or less depending on your liking. Start by grinding the rice to fine powder. In a bowl combine water and rice powder, let it set for at least 6 hours in the fridge. In you blender, add the rice water and the rest of the ingredients together. Blend very well - might take you 3-4minutes until well combined. Strain with cheese cloth, coffee filter or tea strainer. Can I replace the rice with rice flour & use it right away without soaking? Also, powdered vanilla is not available here. Can I use vanilla extract? I realize it will affect the color, but how much should I use? Samaa, thank you for your interest in this recipe. Yes, sure you can use rice flour. Old school is soaking it, but I’ve seen a big chef putting it directly without soaking. If you have in your area an International market OR a farmer’s market like sprouts, you’ll find vanilla in the spice bulk section. It is a common practice to use double the amount of vanilla extract, for example 1/2 teaspoon vanilla powder=1 teaspoon extract. I recommend start little and go up as you test the recipe though as it depends on the quality of the extract you are using. I hope this answers your questions. If you need any more assistance please do not hesitate. Salaam. Thanks for the recipe! I was in Cairo a few years ago during Ramadan and loved Sobia. Ever since then I’ve been looking for the right recipe but all my attempts at recreating the drink have disappointed. Your recipe was a surprise and turned out very close to what I had in Cairo! However I do remember it being thicker and creamier. Is there a way to make this thicker? Perhaps if I add ice and blend? Thanks again for this recipe. 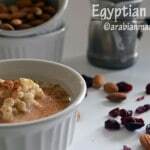 Thank you for your sweet comment and I am glad that the recipe turned out close to what you’ve had back in Egypt. For thickening your sobia, my guess is you add more rice to it, so why don’t you try using like 3Tbs of ground rice and see if it turns out the way you wanted? 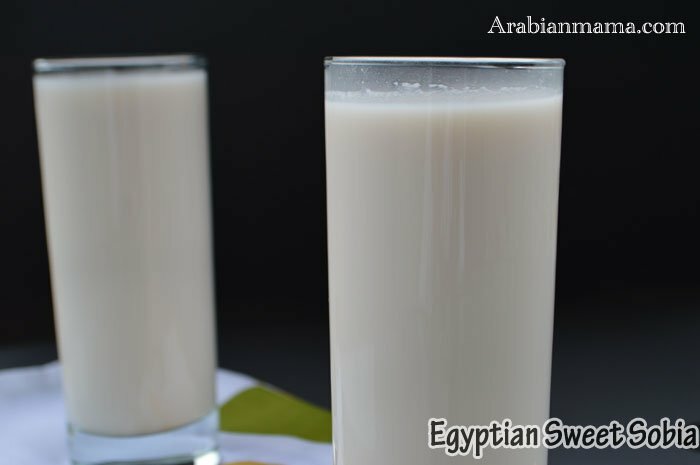 Can you tell me please where to find coconut milk and cheese cloth in Cairo?